Desert Storm is a magnificent imported black stallion representing just the very best Olympic bloodlines in the world today. He is a beautiful type with an artistic head and neck. His movement is big and correct with super bend through the hocks and knees. He is a winning eventer who carries amazing dressage genetics. 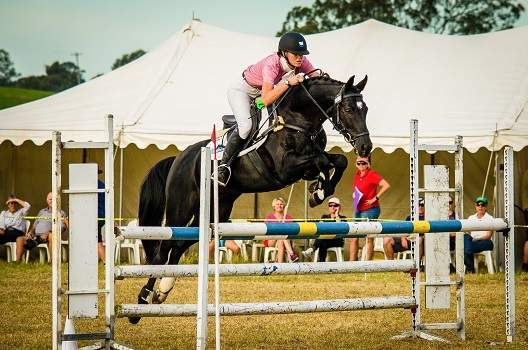 Currently trained and campaigned by Sappho Ransan- Elliott, he has recently gone up the grades in Eventing to 1* and is proving to be a cross country machine. Desert Storm is also winning and placing at medium/advanced dressage with scores of almost 70% on alternate weekends. At home he is schooling in tempi changes and piaffe, with great promise for Grand Prix, while over a fence he does love to jump and approaches the fences with a careful watchfulness and then bascules up over the fences with perfect technique. For the breeding connoisseurs, Desert Storm is bred to win an Olympic dressage medal. He is by Dr Doolittle who is by Donnerhall. Donnerhall represents the number one dressage dynasty in the world. The majority of the top 25 horses at the last two Olympics and World Championships carry Donnerhall influence. Rubinstein can be found on Desert Storms dam line and this blood is also extraordinary and exerts a whopping 21% influence in the genetics of the top 25 Olympic and World Championship horses. For a breeding buff these are lines to die for. Desert Storm is special on all counts.